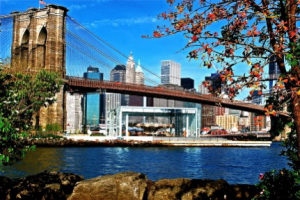 Jane's Carousel | Custom & Private New York Tours, Inc.
Jane, a woman of DUMBO (Down under the Manhattan Bridge Overpass) a Brooklyn neighborhood, spent over 20 years restoring an authentic American Carousel classic that she extracted from Youngstown, Ohio. It is magnificent! Located at the water’s edge between The Brooklyn Bridge and The Manhattan Bridge ensconced in a class cube designed by Jean Nouvel, the French architect. Together with music provided by a Philadelphia calliope and the magnificent view of Manhattan you can’t resist “saddling up” for two bucks. Adults requested! ?